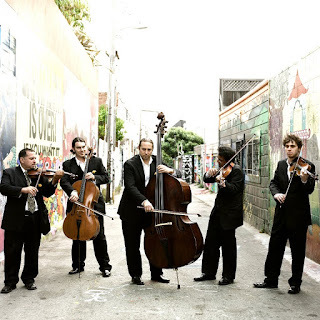 The band is comprised of some of the Bay Area's most exciting string players and is led by bassist and composer Sascha Jacobsen. Sascha's works include elements of improvisation, in a style they call world chamber music. Cello Joe has been warming the hearts of Bay Area audiences for several years. As the creator of the "Cello Madness Congress", Joey has introduced local creative cellists to lovers of the cello for memorable performances. Cello Joe's music uses looping techniques along with beat-boxing and environmentally conscious lyrics, bringing the cello into our modern cultural landscape in San Francisco. Classical Revolution is more than an ensemble. Classical Revolution is more than a presenting organization. Classical Revolution is a global phenomenon, revolutionizing the way live classical music is programmed and heard. Founded in 2006 at Revolution Cafe in SF's Mission District, Classical Revolution has presented close to 1000 performances in the Bay Area in more than 100 different venues.